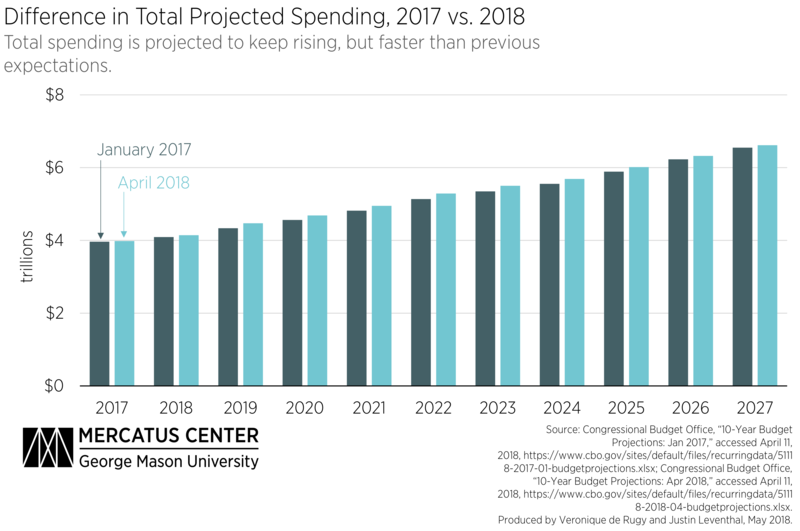 Federal spending is consistently rising in America, but the amount by which it is expected to rise fluctuates with changes in policy. One way to judge those policy changes is by how much they raise or lower federal spending over time. The CBO provides annual budget predictions for the next decade, which is a useful tool for analyzing the effects of policy decisions made by the president and Congress over the previous year. Comparing changes in the reports released in January 2017 and April 2018 shows a predicted total increase in spending from 2017 through 2027 of $1.2 trillion. Breaking this down into mandatory spending, discretionary spending, and interest payments explains what is driving the spending increases. 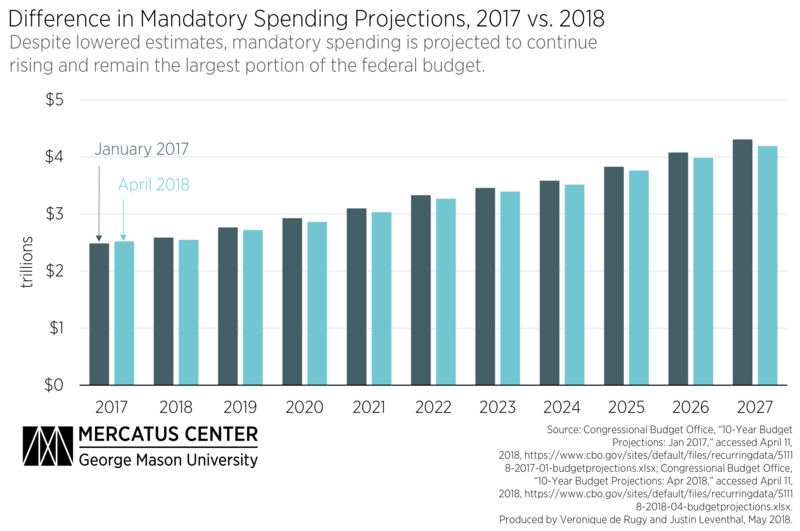 Mandatory spending projections from 2018 are lower than those from 2017 in almost every year. To be clear, projected spending is not falling—it is simply increasing more slowly. Total projected mandatory spending from 2017 through 2027 was $651 billion lower in April of 2018. On the other hand, projections for discretionary spending rose even more significantly than those for mandatory spending fell. The 2018 CBO predicts an additional $777 billion in this category over the same time period. 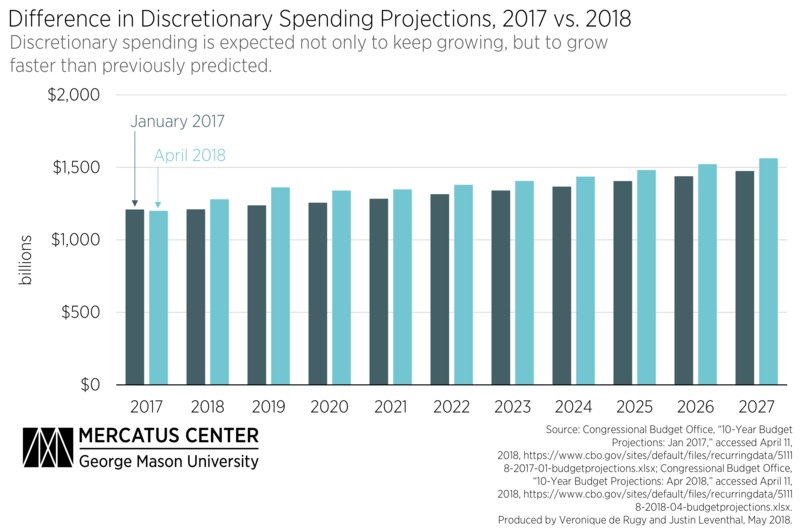 Discretionary spending was not only up in total, but it is projected to be larger than previous estimates in almost every year. 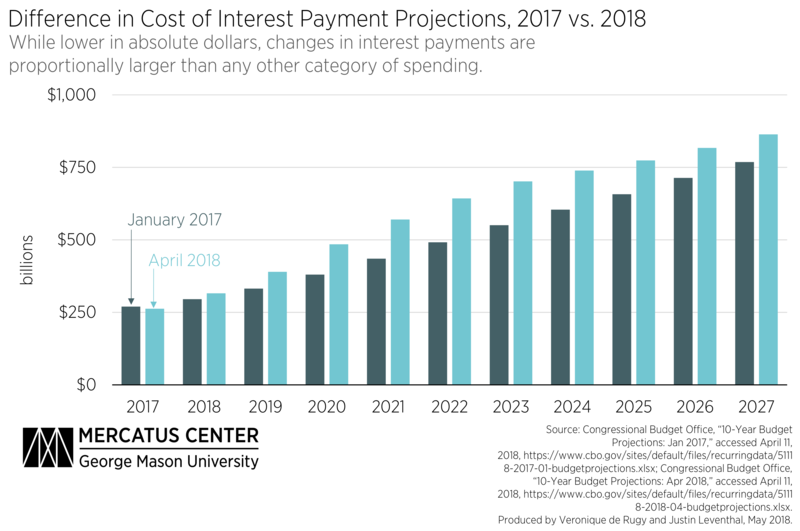 Much like discretionary spending, interest payments are expected to be higher than previous estimates as well. Interest payments alone are projected to drive more than $1 trillion of additional spending, the largest change among the three subsets of congressional spending. The total effect of these changes is that Congress will be spending more every year than it predicted in 2017, costing the American public an additional $1.2 trillion by the year 2027.